Notre unité de BA 4 BR / 3 est idéal pour votre famille ou pour un groupe d'amis. Il y a 11 lits individuels. Chambre 1 a un lit king-size. Chambre 2 a la Reine sur Reine superposé et un lit complet. Chambre 3 lit mezzanine king et 3 lits simples. Chambre 4 (en bas) a un lit queen. Couloir a un lit simple. En bas, le salon est aménagé avec 2 grands canapés en cuir avec une télévision à écran plat de 50 pouces pour profiter du grand jeu. Un grand parking est disponible (et 1 sur le spot de la rue). La grande cuisine est entièrement équipée avec appareils électroménagers en acier inoxydable. Cuisinière à gaz et four, micro-ondes, cafetière, grille-pain, réfrigérateur / congélateur / machine à glaçons sont à votre disposition pour cuisiner quoi que ce soit à partir d'un petit-déjeuner simple à un dîner de Thanksgiving. La salle de lavage est équipé de Samsung à chargement frontal laveuse / sécheuse pour votre commodité. Un fer à repasser et planche à repasser sont également disponibles. Il y a aussi une salle de bain QUEEN CHAMBRE COMPLET DOWNSTAIRS, qui a été récemment rénové - s'il vous plaît voir les photos. Situé à 3 pâtés de maisons des lignes, rue de voitures avec accès au centre-ville, Garden District, Uptown et Warehouse District. Moins de 5 min en voiture du centre commercial et des restaurants sur Magazine Street, Golf à Audubon Park, le zoo Audubon, The Movie Theatre Prytania, Whole Foods Grocery Store. FACILEMENT ACCESSIBLE CENTRE VILLE PAR UBER (12 $) OU STREET CAR (1 $. 25). Peut inclure 4 billets adultes gratuits et 4 enfants gratuits billets pour zoo Audubon ou aquarium pour 1 jour (demander au moment de la réservation). Vie nocturne - distance de marche de nombreux Uptown Monkey Hill, Les Colonnes Bar, Fat Harry, Friar Tucks, Brunos, et par voiture de rue du quartier français avec les nombreux bars de la rue Bourbon. Vous pouvez marcher, prendre un taxi, il über ,, ou de sauter sur la voiture de la rue afin que vous puissiez profiter d'une nuit sans les tracas de la conduite / parking. Une maison de taxi est également une option à un prix raisonnable à 10-15 $. VOISINAGE-Nous SÛR sont situés dans un quartier exceptionnellement sûr et sont dans le district de sécurité Hurstville avec patrouille privée. Les salles de bain ont été récemment rénovées avec un nouveau lavabo / douche dans la grande salle de bains. La douche a été carrelée et a de nouveaux appareils de plomberie. Le second bain a été reglazed et la pression de l'eau est bonne. Le troisième bain est nouvellement ajouté sur le 1er étage. We have rented many properties through VRBO or Homeaway and the likes before, so we 've seen it all. This property was nice for our friends weekend in New Orleans. We had plenty of room to spread out and the location was just a few minutes from Freret street, which has tons of restaurants, and bars. We also were just far enough from Downtown not to be in a constant touristy area, and close enough that it only took 15 min. to get there. We just loved the location as it was a true New Orleans neighborhood! And not a touristy place. We were 3 blocks from Historic and beautiful St Charles avenue and its trolley! The houses in this neighborhood were just gorgeous and people were very nice. We were just a few blocks away from a small supermarket, which made it easy for runs for beverages and breakfast food. The owners were also great to deal with. They were very accommodating and let us check in much earlier than our designated time, they also gave us great recommendations for restaurants, activities , bars and much more, they even gave us some of their tickets to go to the Audubon Zoo, which was really cool to see! The owner also cooked a pot of Red beans and Rice for our group. It was delicious and much appreciated the night of our arrival, when everybody was tired and hungry! Thanks again for the great times Chris! See you again soon. Overall, the experience was average. I've rented many homes on VRBO and Airbnb in the past, but this experience was particularly lackluster. The house is as described. The neighborhood is good. It's quiet but walking distance to a hip little strip and and a 20 minute drive to the French Quarter. The number of rooms and beds available are exactly as described on the listing. However, it should be noted that house is a duplex. 13 people in a living room is noisy regardless of how mindful they are. Add in the fact that we're in New Orleans, and let's be real, there will be some drinking- it's loud. We're a group of 30-somethings, so we've toned down a bit from our more rowdy days. But we were still asked to quiet down on Friday and Saturday nights. I chose to rent a house because I knew we'd be loud. I would likely have rented elsewhere if I knew this was a duplex. In addition, we had some issues with the house and communication with Chris. I messaged him a few times prior to our arrival, and I felt like I was bothering him. For example, he didn't know the answer to my question of, "are their toiletries in the house?" (There are). When we arrived, the code didn't work to get into the house. The neighbor let us in. I called Chris, but his answer wasn't clear to me how it was going to be fixed. About an hour after, I texted him telling him we fixed it ourselves. In addition, the fridge was broken the entire time. We learned this about 5 hours into our stay, and I texted Chris immediately. He told me that it had been broken before, but that he thought the repairman fixed it. My friend is diabetic and carries insulin, so we had to find a workaround for that. We also had to throw out all of the food that we brought that wasn't eaten the first day. Chris never offered an apology or any kind of fix (coolers, a credit, etc.). This could have been a huge problem if we planned to cook all our food. There are many chores to be done when you leave including stripping the bed, taking out all garbages, cleaning out (broken) fridge, etc. There's also a fee list on the closing details telling you what happens if you miss something. That seemed really condescending and left me with a bitter taste in my mouth. I did receive my full deposit back. But I waited until I got it to write this review. To sum up, I would try to find a different place if I were you. But if you can't, I think it's fine in a pinch. The property is centrally located. The house comfortably slept our group of 12. The kitchen is adequate, but who cooks when in NOLA. The bed rooms were well apportioned, water pressure in the showers excellent. The furnishings are bit dated but comfortable. The house served its purpose well for our team of 12. 14 of my friends came to attend my 40th Birthday party.... I was looking for a safe and nice place for them... Everything was very nice and not far away. 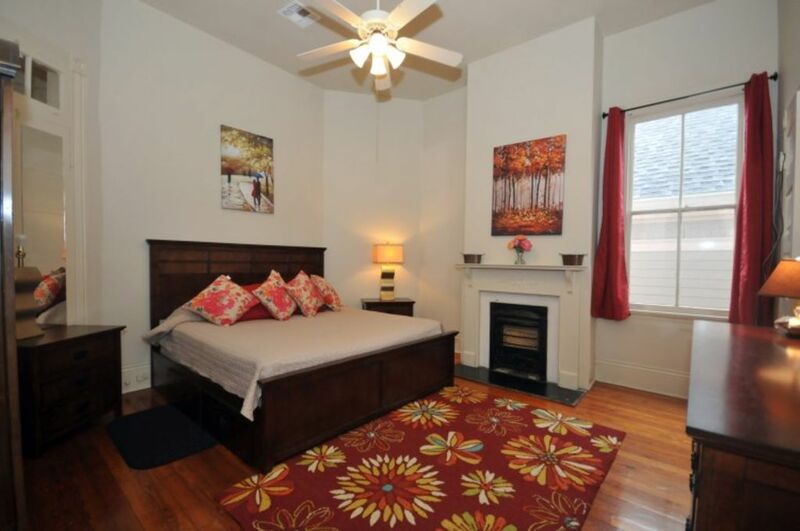 This was a great property with close access to all of the major attractions New Orleans has to offer. We utilized Uber and could get to Bourbon Street and the French Quarter within 10 minutes. Being able to get away from Bourbon Street at times was a nice luxury to have and this house gave us that option. The check in and check out processes were seamless and the house was very spacious and in a nice neighborhood. I would highly recommend this property to any future visitors of New Orleans. $100 cheaper if paying with echeck. Once reserved, if canceled by renter, there will be no refunds. Reservations are not confirmed until payment is received. No refunds for inclimate weather. Please inquire for special events (Mardi Gras/Jazz Fest/Sugar Bowl/New Years/ etc). MARDI GRAS $7500 3 BED/ $8500 4 BED EVENT RATE.